Let Sport Court Houston build your dream court right in your own backyard or your commercial court for your amenity area or community park. With over 30 years of court building experience, Sport Court Houston is the Houston court building pro. Hard courts, clay, grass, or modular. Our Sport Court® tennis courts are perfect for your backyard, home, apartment complex, business complex, HOA, Club, or park project. 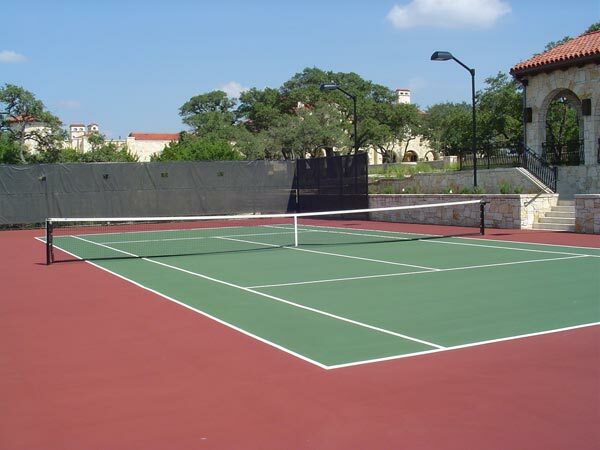 Currently, Sport Court® Houston serves residential and commercial facilities, building and installing tennis courts, QuickStart Tennis courts and pickleball courts. Click here for a full list of a few of the local Houston Area tennis courts we have installed. We include high quality lighting, fencing, and component equipment to create a long-lasting, low-maintenance facility. Tired of looking at cracks in your court? Our Sport Court® and Premiere® tennis court surfaces are a permanent fix. They also have the latest technology in athletic performance surfacing, offering vertical cushioning and patented "lateral forgiveness" to absorb the shock of sudden starts and stops in hard play. Our surface is independently rated by the International Tennis Federation for both medium and fast pace play. Whether we provide you with tennis court resurfacing for your existing tennis court or we build you a tennis court from scratch, we are your Houston game court building specialist. Contact us today for a free consultation or on-site estimate.